Women’s Day is a great occasion to make the women in your life feel special and important! Celebrated worldwide on 8th of March irrespective of nationality, religion or color, the day marks a feel of unity and appreciation of women. While the occasion calls for celebrations , what makes it more meaningful is the gifts- a gesture of love, affection or respect to the women in our lives. Celebrate this women’s day by giving a beautiful and worthy gift to your mother, sister, wife, daughter or a female friend and colleague to make them feel special. This Women’s Day, Tajonline.com brings you the nicest surprise for your recipient! 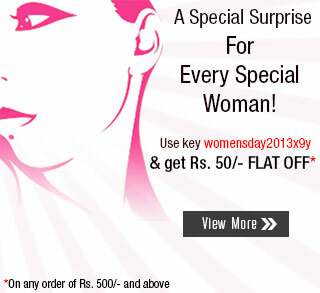 Just use the key womensday2013x9y while placing your order, from 1st-8th March 2013 and get Rs. 50/- off on a purchase of Rs. 500/- and above. Here’s an enchanting collection of Women’s day special gifts. Choose the best of the lot and gift it to those special ladies as token of love and care.